Fiction – paperback; Back Bay Books; 613 pages; 2004. Sometimes you pick up a book and get totally swept away by the story that you forgot all sense of time or place. So it was with this critically acclaimed novel by Pete Hamill, the former editor in chief of the New York Post and the New York Daily News. At 613 pages I expected this hefty tome to last me a couple of weeks but I was so caught up in the life of Cormac O’Connor, an Irish immigrant who lands in New York in 1740 and remains…forever, that I raced through it in less than a week — and even then I tried to draw out the last hundred or so pages because I didn’t want it to end. I’m not sure how to describe Forever. It’s part swashbuckling adventure, part romance, part historical drama, part fable. It spans more than three centuries and tells the story of a poor rural Irish lad who is granted immortality, as long as he never steps foot off the island of Manhattan. And because part of his deal is to ensure he lives a very full and active life, rather than sitting on the sidelines merely existing, he throws himself into all kinds of situations. Over the course of some 300 years he witnesses (and sometimes partakes in) many great scenes in history, including the American Revolution and the destruction of the World Trade Centre on 9/11. During this time he also meets and falls in love with several women, learns many different trades, carries out various professions (printer, artist, journalist) and teaches himself a host of languages. 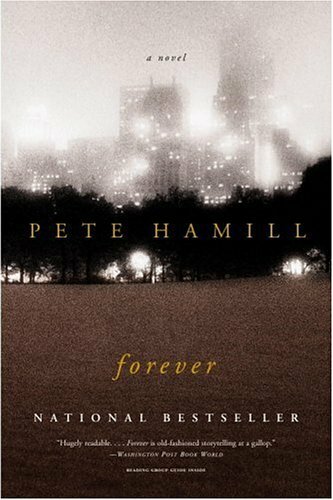 What I loved most about Forever is the way in which Hamill has made New York as much a character in the book as any of the people Cormac meets. As time moves on you get to witness changes to the city’s structure, its ethnicity, its politics; you see it grow and change; you discover how it transformed itself from a British outpost for trade and commerce to one of the world’s most glamorous and exciting urban centres. And along the way you meet real characters — good, bad and ugly — from history that shaped the way the city is today. But the book is not just about Manhattan. To my surprise the first 124 pages are set in Ireland, so you get a brief sense of Celtic history, too. My only quibble is that Hamill devotes much attention to the 18th and 19th centuries but then skips ahead from 1868 to 2001 in one giant leap. The great technological advances during the 20th century are mentioned only in passing, and all the best bits about New York history — the jazz era, the Great Depression, prohibition, the quest to build taller and taller buildings — are given scant regard. But, on the whole, this does not destroy the magic of this wonderfully entertaining and enlightening story. Forever is a unique and original tale about history, humanity and the sometimes horrible things people do to each other. But it’s also a story about courage, conviction and how we are doomed to repeat the mistakes of the past if we do not learn from others who have gone before us. I thoroughly enjoyed it. Wow, I’m glad I came across your review on this one. A long time ago I read another great review of this book and bought a first edition. But when I went to read it, I couldn’t get into it, and then forgot all about it. After reading your review, I’m thinking maybe I’ll pick this one up again….thanks. Lisa, it’s a great book, but you do have to wade through a lot of Irish stuff before you get to the New York story. That can be off-putting if you’re not expecting it. I just couldn’t get into this book. I liked the beginning, but got dismayed when I realized he was going to be tracking down people to kill for revenge… I didn’t like that and it put me off the whole book. Your review got me interested in this book and I mooched it. It arrived last week and I’m looking forward to reading it! Kinuk, wow, that’s quite a find on bookmooch!! Hope you enjoy the book. I finally just had to put this book down. I enjoyed the beginning….Cormac’s life in Ireland. I loved his family and all they stood for. I kept reading every word until about page 400, then I just could not go any further. I guess I like historical fiction with more history then fiction. I really became bored of the “F” word and his sexual exploits. Last night I was trying to read it and started skipping pages and then I just gave up and turned to the end. I don’t think I will keep it in my library at home. I will give the book away. I am ready to move on to something else.